The retail industry is going through a transformation driven by customers who expect a seamless experience between online and in store. These customers are looking for tools that can make recommendations or better help them find what they need. And they want the entire experience to be faster and more personalized than ever. As a result, many retailers are turning to cloud technologies to help meet these needs. Google Cloud is already partnering with retailers across the globe to address these challenges. Brands including Bed Bath and Beyond, Carrefour, Designer Brands, IKEA, Kohl's, Loblaw, METRO, Ocado, Shopify, Target, The Home Depot, Ulta, and many more are leveraging Google Cloud technologies in areas like eCommerce hosting, data analytics, machine learning and workforce transformation in order to better serve their customers. Today, we’re announcing a number of new retail solutions, created in collaboration with our ecosystem of retail partners and designed to solve specific business challenges that retailers face across all parts of the value chain. We’ve invested deeply in our solutions for retailers and many take full advantage of Google Cloud’s expertise and innovation in areas like data analytics and AI. This will help retailers transform their businesses and meet the growing expectations of their customers. 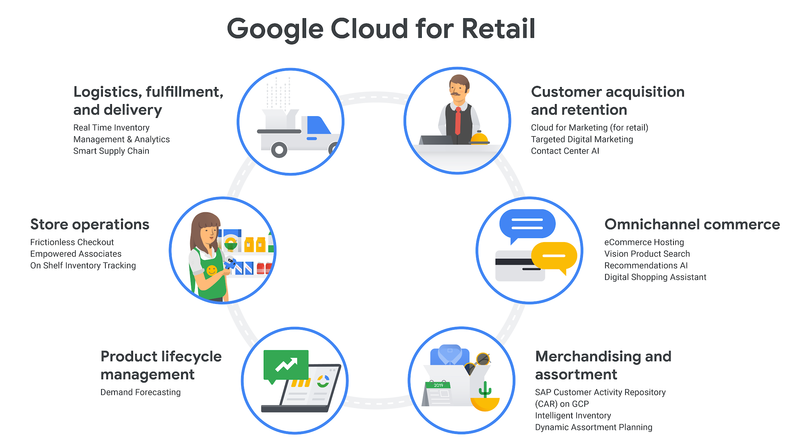 Google Cloud for Retail offers a robust set of solutions that enable retailers to quickly take advantage of cloud capabilities for specific use cases—from store operations to merchandising to customer acquisition and retention. Our solutions are focused around six core pillars in the retail value chain and aim to help companies apply cloud technology to get the most from each. Here’s a brief look at a few of the retail solutions available today. Having a website crash during peak traffic moments can impact both revenue and brand perception. eCommerce Hosting provides flexible, reliable and scalable hosting capabilities for a brand’s eCommerce platforms. In addition, Google Cloud’s CRE program provides a white glove treatment with technical architecture reviews and peak season operations support to help retailers deliver a seamless shopping experience for their customers during the most critical times for their business (such as Black Friday). Shopify, an e-commerce platform supporting more than 800,000 independent retailers, went all-in on Google Cloud as its infrastructure provider, with 100 percent of its retailers running on our platform. They had a record breaking Black Friday Cyber Monday in 2018 with a peak of nearly 11,000 orders created per minute and around 100,000 requests per second being served for extended periods during the holiday weekend. Customer experience is a key advantage traditional stores have over their online competition, yet inventory inaccuracy and a lack of real-time visibility can cause customers to leave empty-handed and frustrated. The Real Time Inventory Management and Analytics solution developed by our partners provides inventory visibility across shelves, aisles, and stockrooms giving retailers valuable data to improve the in-store experience of their customers. An empowered, connected, and productive workforce is key for retailers to deliver compelling shopping experiences to their customers. The Empowered Associates solution brings the collaborative power of G Suite along with the social intranet capabilities from our partners to organize, engage, and inform the entire retail organization. Visit our Retail Solutions page to see the full list of available solutions. Advances in AI and machine learning have hugely impacted the retail industry. We’ve built a number of solutions that leverage Google Cloud’s AI and machine learning innovations to help retailers solve their unique challenges. For example, Vision Product Search, which uses Cloud Vision technology, helps retailers create engaging new mobile experiences by integrating Google Lens-type capabilities. Customers can take photos and screenshots from their phone of products they like, and the mobile experience will provide real-time results of similar or complementary items from the retailer’s product catalog. Customers can find what they want instantly, and experience less friction in the product search and purchase process. When customers browse a retail website, they often expect recommendations for different or complementary products. Product Recommendations, powered by Google’s Recommendations AI, helps retailers automatically deliver hyper-personal recommendations, at scale. It continuously learns and adapts to real-time user behaviors and dynamic environments such as changes in assortment, pricing, and special offers. In addition to these retail-specific solutions, a number of our AI announcements this week at Google Cloud Next ‘19 are particularly relevant for retailers. Most retailers depend on their customer care centers to answer questions, process requests, and meet customer needs. Contact Center AI, now in beta, continues to help retailers build modern, intuitive customer care experiences with the help of Google Cloud’s robust AI capabilities. You can learn more about our updates to Contact Center AI in this blog post. Like many industries, retailers frequently rely on structured data to help them perform predictive analytics to quickly fill gaps in their product mix and optimize distribution, promotions and pricing. AutoML Tables, in beta, makes it possible to automatically build and deploy state-of-the-art machine learning models on structured data in just a few clicks, reducing the total time required from weeks to days. This means you can easily use your enterprise data to predict outcomes that can help you maximize revenue, optimize your product portfolio, and better understand your customers. Read more about AutoML Tables in this blog post. Accenture: Accenture's Hyper-Personalization solution enables retailers to turn data into business insights that can be applied to increase customer response rates, lifetime value and loyalty. Combined with real-time offer management, this solution extends the omni-channel experience to customer engagement. Bluecore: Bluecore helps retailers uncover new revenue opportunities through highly personalized, relevant and ROI-focused customer experiences. Capgemini: Capgemini has created the Smart Store Guide, a digital shopping assistant designed to provide seamless assistance through voice technology. Deloitte: Deloitte's solutions for the retail industry address consumer insights and marketing analytics and extend to a full suite of supply chain solutions including demand forecasting and budgeting, internal and external distribution, optimization, and benefit monitoring. LumApps: LumApps leverages Google Cloud technology, including G Suite, to create a central hub for resources such as corporate news, social communities, employee directories, and go-to G Suite apps. This offers a rich experience for everyone in the retail organization, from headquarters to delivery centers to stores. Publicis Sapient: Publicis Sapient helps retailers break down data silos in order to connect all the data points and paths of the customer journey, creating a holistic view of the customer and providing retailers the ability to turn insights into action. Salesforce: Salesforce is partnering with Google Cloud to help transform the way retailers provide customer support. Salesforce Service Cloud will integrate with Google’s best-in-class speech recognition, synthesis, natural language understanding, and agent assist as part of our Contact Center AI partner program. SAP: SAP is helping retailers deliver innovative experiences with insights into behavior and demand. Their Dynamic Assortment Planning solution uses Google Shopping reporting to give planners intelligent insights to enhance inventory, boost customer satisfaction, and increase profitability. Tableau: Tableau is working with retailers to help them collect, transform, analyze, and visualize retail data across marketing, merchandising, supply chain, voice of the customer, and store operations. Trax: Trax is working with retailers to improve the in-store experience by providing inventory insights with image recognition. Tulip Retail: Tulip Retail has created solutions designed to improve store performance and sales associate effectiveness using machine learning and analytics. Today’s announcements are part of a growing set of solutions aimed to help retailers grow their businesses and offer unique customer experiences at every stage of the shopping journey. To learn more about retail solutions on Google Cloud, visit our website.